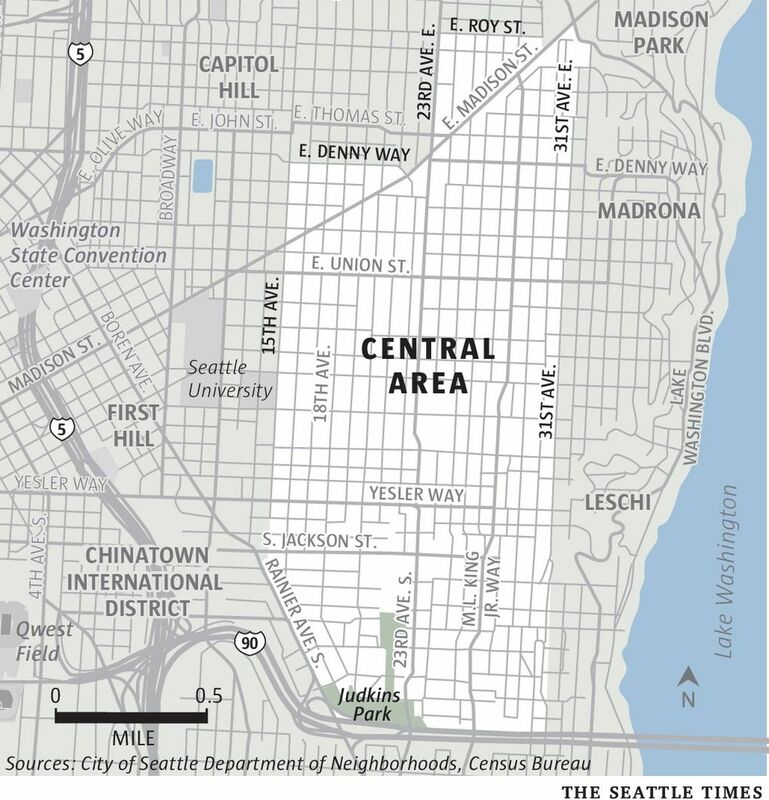 Although whites are increasing fastest in Seattle’s Central District, other minority populations have also grown. The numbers of Asians and Latinos saw a big jump between 1990 and 2000, and they now make up nearly a quarter of the neighborhood’s inhabitants. 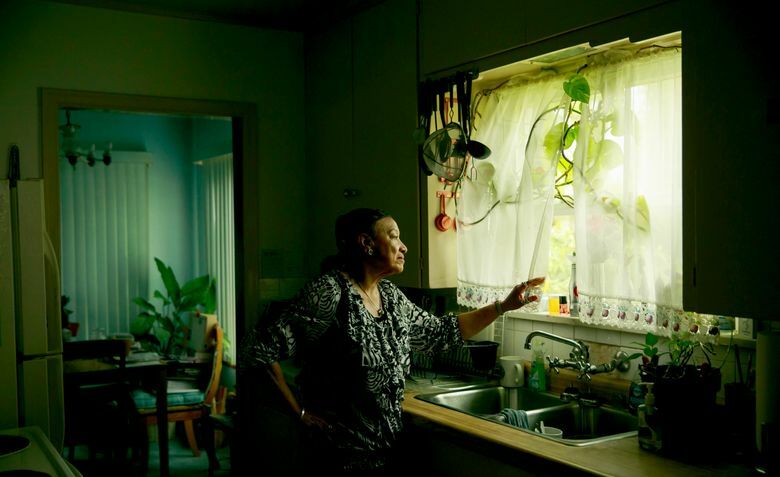 When Rosalie Johnson, 84, moved to Seattle’s Central District in 1956, it wasn’t a lifestyle choice. “We didn’t have a choice,” she says. Johnson called me after she read a column I wrote about people moving to Seattle’s pricey, centrally located neighborhoods — including the Central District — for the lifestyle and convenience. Let’s just say that column ticked her off. When Johnson and her husband came to Seattle, restrictive racial covenants prohibited the sale or rental of properties to blacks (and often Asians and Jews) in neighborhoods outside of the CD and the Chinatown International District. “Convenient? It wasn’t convenient for us back then,” she says, recalling some of the obstacles that people in the neighborhood faced. “Do you know how hard we had to fight just to get them to run a bus line down 23rd Avenue?” It’s one of the neighborhood’s main thoroughfares. Johnson still lives in the small home that she and her late husband, Felbert Johnson, bought in 1961, with the help of the G.I. Bill. But there has been tremendous change all around her in the intervening decades. By the 1970s, it wasn’t as easy to find good jobs, like the one Johnson’s husband had with Boeing. Drugs started to become a problem, too, and some folks left for the suburbs south of the city. But no factor changed the area more dramatically than the gentrification that began in the late 1980s. While many of our city neighborhoods have gentrified, nowhere more than in the CD is there such a pronounced racial component to that transformation. Although whites are increasing fastest, other minority populations have also grown. The numbers of Asians and Latinos saw a big jump between 1990 and 2000, and they now make up nearly a quarter of the neighborhood’s inhabitants. In fact, it’s only the black population that is declining, and that trend is projected to continue. The black share of the population will shrink by about 1 percent per year, according to Nielsen. 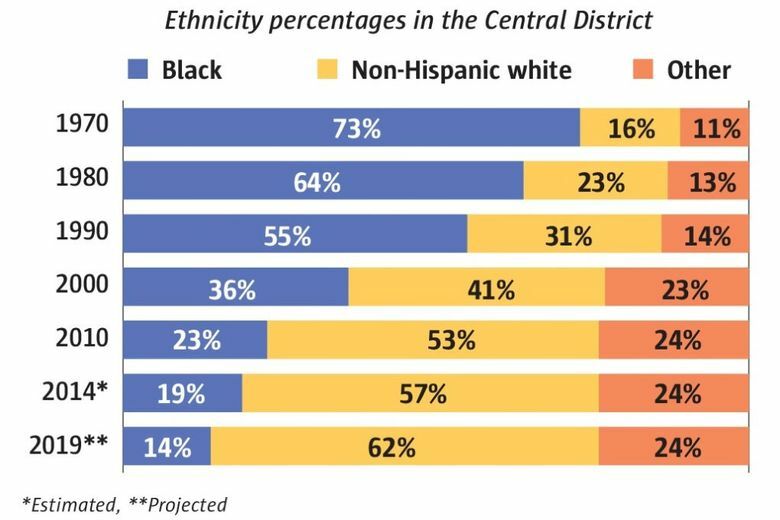 If that holds true, within a decade, the CD will be less than 10 percent black — not so different from Seattle as a whole. Johnson says the biggest obstacle for blacks staying in the neighborhood is the cost of keeping up their homes, including the steep property taxes. While Johnson is doing fine — “I was always a great saver,” she says — none of her children will be able to afford to keep the home. That’s a common story in the CD. She says the infusion of new money into the area is apparent, with homes being remodeled and expanded. Her block looks beautiful, but the neighborhood doesn’t feel the same. 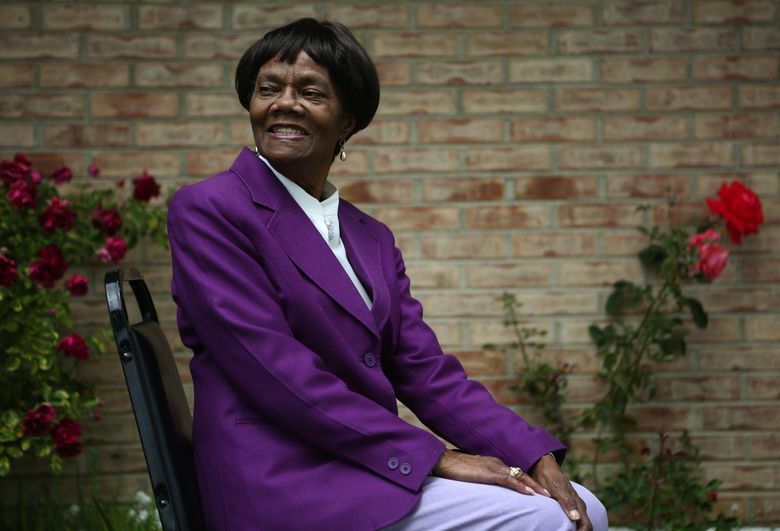 She still finds a sense of community at her church, Mount Zion Baptist, and at the Central Area Senior Center, where she volunteers as a greeter, saying hello to everyone who comes in.